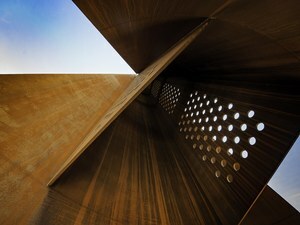 Murray Steel Products are a specialist supplier of profiled steel plate for architectural sculptures and have provided custom components for numerous well-known sculptures. 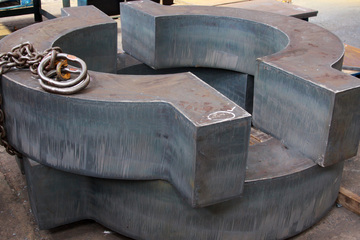 Our in-house processing team is equipped with state-of-the-art HD Plasma & Gas Profiling machinery and specialises in producing custom profiles. 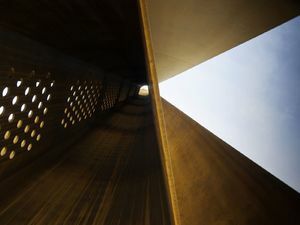 Murray Steel Products are leading suppliers of weathering steel plate to the UK’s construction, rail, bridge building and architectural industries. 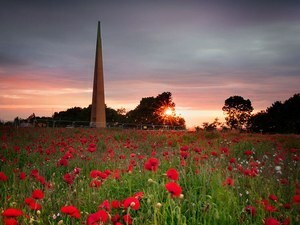 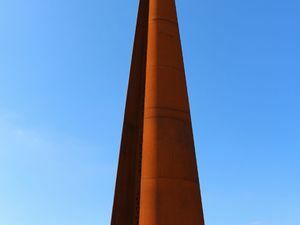 The International Bomber Command Centre Memorial Spire, the UK’s tallest war memorial stands at 31.09m high; made of S355J2W Weathering Steel supplied by Murray Steel Products. 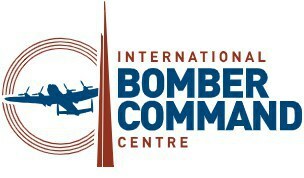 In 2009, the Lincolnshire Bomber Command Memorial Trust was formed with the dream of building a memorial within Lincolnshire which commemorated the bravery and sacrifice of those who served and supported Bomber command. 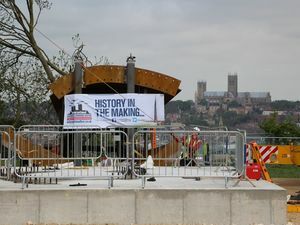 We had previously worked with the appointed steelwork contractor on a number of other architectural structures and bridge projects. 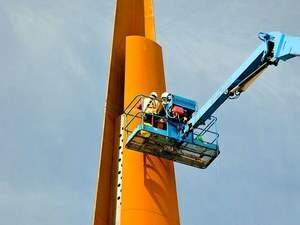 Happy with our technical capabilities and customer service, they selected Murray to supply the bespoke solution required for the Memorial Spire. 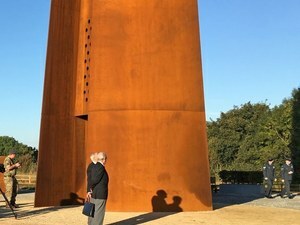 Weathering steel, specifically S355J2W, was chosen for the project as it fulfilled both the structural and aesthetic requirements, as well as being maintenance-free throughout the lifetime of the sculpture. 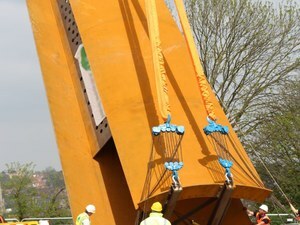 Our team supplied 10m segments of 30mm thickness S355J2W steel with high-quality 100mm diameter profiled holes, all produced to architectural standard. 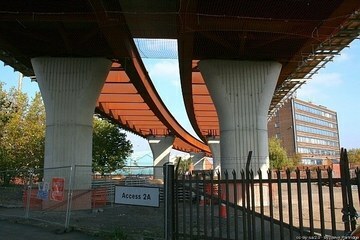 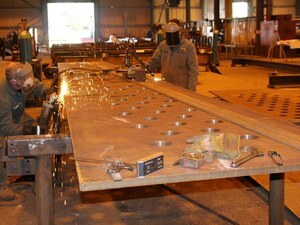 The segments were supplied flat to allow them to be rolled into shape. 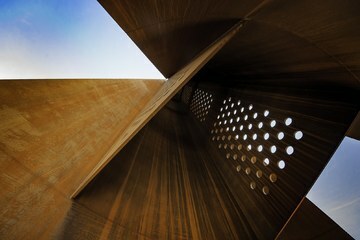 A computer-generated model was used in the cutting process to ensure complete accuracy and to minimise material waste. 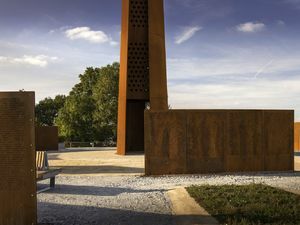 The steel segments were then used to construct the design by Stephen Palmer of Place Architecture, which is intended to commemorate the courage and commitment of those who served Bomber Command during World War II. 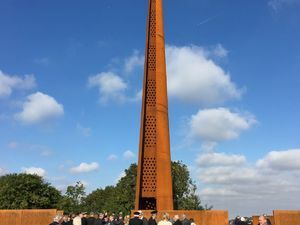 The Spire was unveiled at the International Bomber Command Centre near Lincoln in October 2015 at a ceremony attended by an audience of 2,600 people, including 312 veterans, and subsequently won a 2016 Structural Steel Design Award. 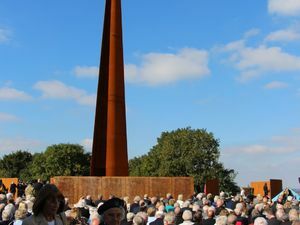 The design of the Spire is based on the dimensions of the Avro Lancaster bomber and the finished Memorial Spire is 31.09m high (equal to the aircraft’s wingspan) and 5m wide at the base (the width of a Lancaster’s wing). 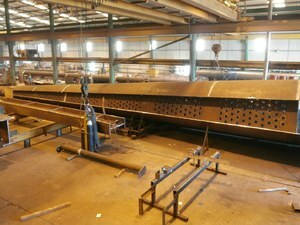 For more information about Murray’s steel plate supply and processing services, contact us on 0114 250 3602 or via the website.